Engineering is about solving problems and this is exactly what ANT Telecom's team of skilled engineers do every day. In our latest blog, two of our engineers talk about the work they did that led them to win an award for a customer project. Using the latest radio technology on the market, the team at ANT Telecom designs solutions to whatever challenge a customer may have, whether this is lone workers, alarm messaging or amalgamating a number of different radio platforms into one. We install radio systems such as repeaters, aerials and trunked systems, but most importantly can integrate these into an existing infrastructure, which can help our customers in a number of ways. For instance, we can connect a radio system to an existing telephone system, meaning employees can dial out using a radio handset and converse with someone on a landline or mobile phone. We can integrate to building or process monitoring systems to ensure that up-to-date site or plant alarm information is sent directly to engineers or maintenance staff that need to deal with the issue. This type of automation can really speed up processes as it takes away the human bottleneck of relaying alarm messages. An IP network can also be used so users can talk to other users on different sites using their radios. This was massively beneficial for one of our Energy customers because it meant they didn’t need to duplicate technology across their wind farms or have them continually manned. Instead they could operate a centralised control room model that helped them to keep costs down. Importantly, all of our radios come with support contracts and SLA’s to help keep the radio systems “on”. We recently completed a major project for a UK Government Department, upgrading from an analogue public announcement (PA) system to a digital PA system, using Hytera digital radios and ANT’s Alarm Messaging Server (AMS). PA systems are used to broadcast voice messages to a site. They use it specifically for broadcasting emergency messages such as security and other pre-recorded announcements. There were other benefits of ANT’s design too. The PA wireless system doesn’t rely on any cabled or network infrastructure and is completely battery backed, providing 2 hours of autonomy. If any mains are lost to any of the Radio Public Address (RPA) units, then it will report this to a system administrator via the service radios identifying its location and that power has been lost. Because it is completely autonomous it will continue to operate if there is a complete network, telephone or mains power failure onsite. The solution provides the ability to centrally control and broadcast sensitive announcements that are completely secure. This is achieved by sending Real Time Tone Decoding Messages (RTTDM) over the radio network. The ANT DMR utility board decodes the tones and plays a pre-recorded announcement over the loudspeakers. This means that anyone trying to eaves drop off-site would only hear the toned message rather than the real announcement. Up to 16 different pre-recorded messages can be played. Furthermore, it’s possible to broadcast different announcements to different buildings all at the same time. Robert Green, Marketing Manager at Hytera adds: "Our engineering award provides recognition and reward for technical engineers within our partners who understand the customer's requirement, provides a value-add solution and goes above and beyond. 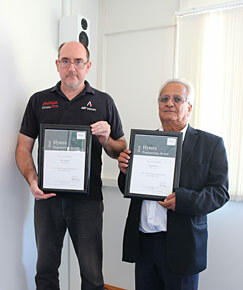 The project Ranjit and Peter worked on really stood out against other entries and this is a well deserved award." To learn more about ANT Telecom's solutions, call us on 01494 833100 or email one of our experts at info@anttele.com.